I realize it’s only my first month of having a kindergartner, so I’m probably not allowed to whine about packing lunches yet, but let’s just say it’s a Hard Job. Why don’t we have any bread? Why do we have bread but she doesn’t want a sandwich? Why, one of those times when we didn’t have any bread, did I make noodles with parmesan cheese (literally: just noodles and parmesan cheese) and unwittingly set the standard against which all future lunches would be measured and found wanting? So we’ve hemmed and hawed and negotiated about what should go in the lunch box, and I’ve found myself sending combos like cashews, leftover green beans, chips & salsa, and strawberries…which isn’t BAD, it’s just weird as heck. I keep thinking that I need to have a stash of muffins in the freezer, to act as bread substitute, tummy filler, and quasi-treat. 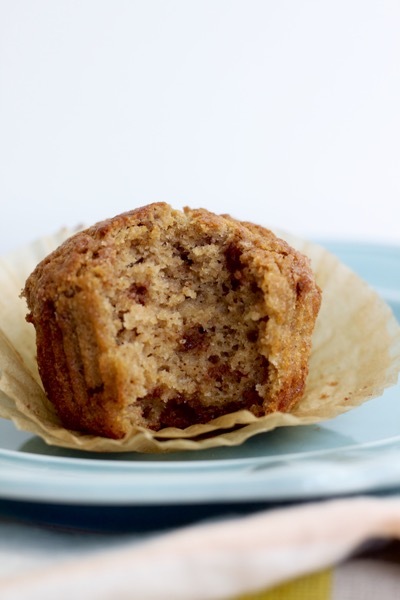 Thus, these whole wheat cinnamon chip muffins were born! And ooh, I like ’em. They’re coffeecake-y, cinnamon-toasty and tender, packed full of cinnamon chips and you make them in ONE BOWL, yes and amen. The other day my 3-year-old was asking if she could have “some of those brown nuts” for a snack. After offering her every kind of nut in the pantry I finally figured out she was talking about these cinnamon chips! 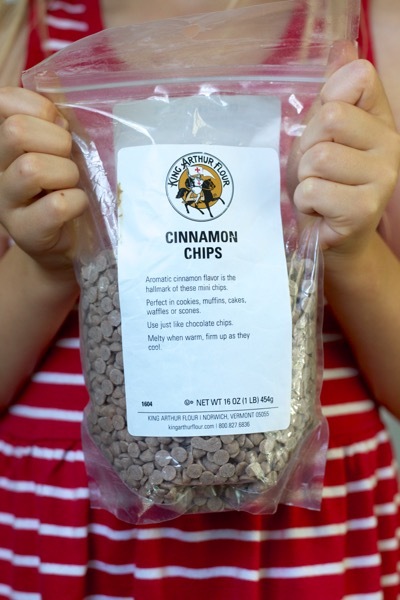 I like these King Arthur cinnamon chips – they only have 5 ingredients, no artificial colors, and they contain real cinnamon (compared to more than a dozen ingredients and no actual cinnamon in other brands). They’re on sale currently – I’m going to stock up! 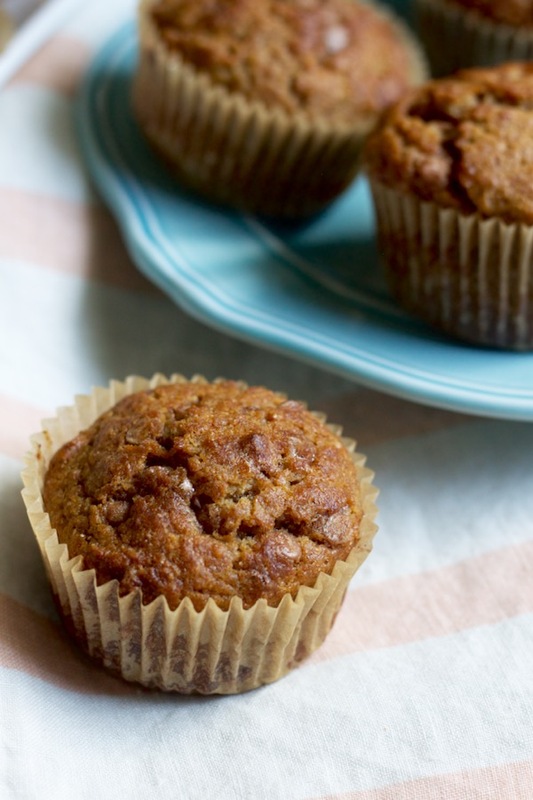 These one-bowl whole wheat cinnamon chip muffins are tender and coffeecake-y, packed full of sweet cinnamon chips – a perfect easy breakfast or lunchbox treat! 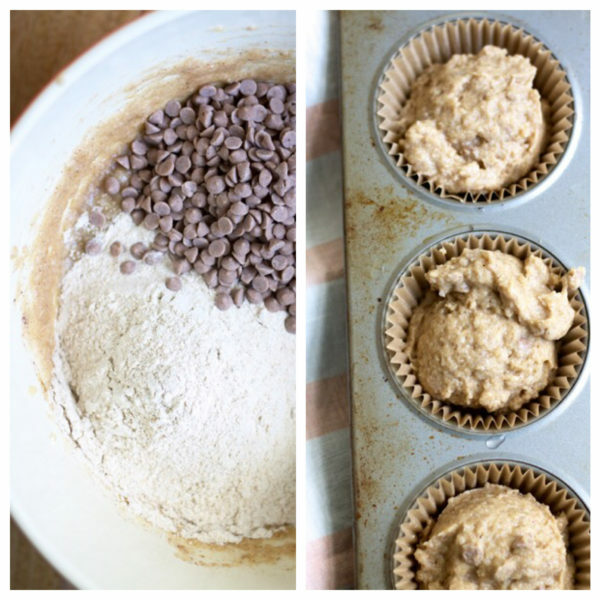 Preheat oven to 400, and line a 12-cup muffin tin with paper liners (or grease the cups). Melt the butter in a large microwavable bowl. Add applesauce, eggs, vanilla, and brown sugar and whisk to combine. Add cinnamon, baking powder, and baking soda and whisk. Add flour and cinnamon chips and fold and stir with a spatula until just combined. Scoop the batter into the prepared muffin tin, filling the cups about 2/3 full. I like to use a large cookie scoop for this! Bake for 18-21 minutes, until they are light brown on top and a toothpick comes out clean. Remove the muffins from the pan as soon as you’re able to (I slide a fork beside them and lift them out) and transfer them to a wire rack to cool. This recipe is adapted from Cinnamon Raisin Quick Bread from the 100 Days of Real Food cookbook by Lisa Leake, which is also delicious! This post contains Amazon affiliate links, which means that I earn a small commission if you buy through my link – at no cost to you. Thanks for supporting Bet On Dinner! Just made these for the first time, and they are shockingly good! 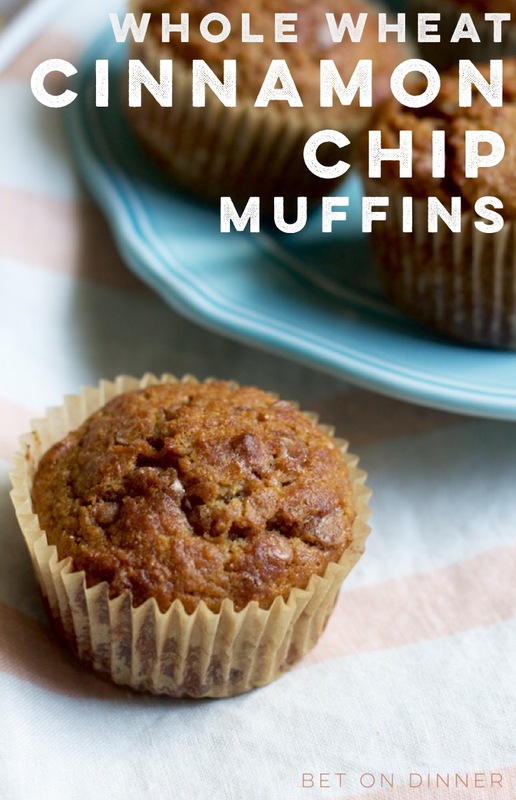 The recipe is simple and is mostly ingredients that we always have (except for cinnamon chips. Which we will now always have.). LOVE the one-bowl-ness as well. Made it a fun and (mostly) enjoyable treat to make with my 2 year old. 😉 I have a feeling these will be on repeat at our house. Thanks, Bet! Ooh, yay, so glad you guys liked them and that you had such a good helper! Sometimes it’s so nice to only have one helper, even if it’s a 2yo one! !